for fuller spectrum daytime light. Requiring no external ballast electronics, these lamps can be fitted into regular screw fit lamp holders. 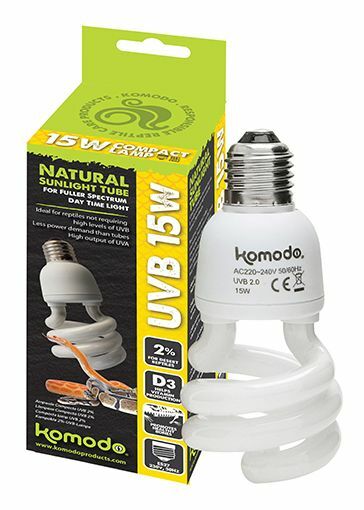 They�re energy efficient too, emitting very little heat and use less power than UVB tubes. Which wattage? Choose higher wattage lamps for larger enclosures e.g. 15W for enclosures up to 300mm and 26W for enclosures up to 600mm.